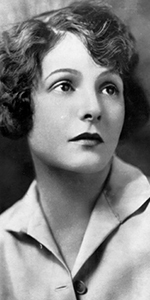 Norma Talmadge was a popular star in silent films, who reached the peak of her career in the early 1920s, and began producing her own pictures with husband Joseph Schenck. Born into an unhappy family with an alcoholic father, Norma and her younger sisters Constance and Natalie, were raised by their mother Peg in hardscrabble conditions in Brooklyn. Peg snuck all three girls onto the Vitagraph studio lot in Flatbush, where Norma was given a role in a short film, The Household Pest (released in 1909). She continued to play bit parts for $25 per week. By 1911, she had been selected to play the small but important role in an adaptation of A Tale of Two Cities (released in February, 1911), as Mimi, who accompanies the Hero, Sidney Carton, played by Maurice Costello, to the guillotine. A strong work ethic, appearances in many films in a wide range of charcaters, and some acting classes strengthened Talmadge's impact on audiences. She had completed a large role in The Battle Cry of Peace (released in September, 1915), and it seemed that she was on the verge of stardom at Vitagraph, when Norma's mother Peg, got her a contract to make films for National Pictures out in Hollywood for $400 per week. The trip to make the films proved to be a disaster, as the studio folded just after the completion of Captivating Mary Carstairs (released in July, 1915), in which a small role was given to Norma's sister, Constance. 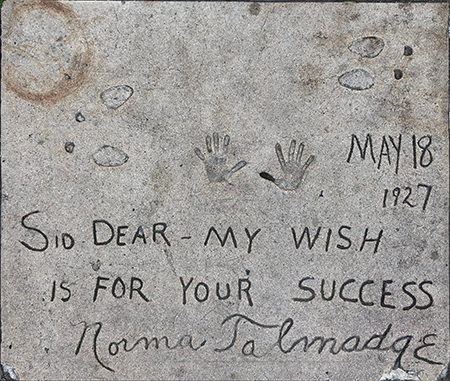 Stranded in Hollywood, the Talmadges appealed to D. W. Griffith at Triangle Pictures, where Norma starred in several films, including the comedy The Social Secretary (released in September, 1916). When her Triangle contract expired in 1917, Norma and her mother and sisters returned to the East Coast, where she met and married Broadway producer Joseph Schenck, who set her up with her own studio, Norma Talmadge Film Corporation, releasing through First-National. Joseph and Peg controlled Talmadge's career from there on. Norma's lavishly produced films were doing well, Constance had been set up with her own production unit, and Roscoe "Fatty" Arbuckle was making films for the studio, roping in vaudeville star Buster Keaton to make films. Keaton would marry sister Natalie in 1921. Norma made four to six films per year between 1917 and 1921. The titles alone will give you the gist of it: By Right of Purchase (released in February, 1918), The Heart of Wetona (released in January, 1919), The Probation Wife (released in May, 1919), She Loves and Lies (released in January, 1920), Yes or No (released in June, 1920), Passion Flower (released in April, 1921) — you get the idea. Her team included frequent director Sidney Franklin, designer Lucile, and publicist Beulah Livingstone; through the fan magazines, she became a tastemaker, dispensing fashion advice through a monthly column in Photoplay magazine. Norma enjoyed her greatest success with the Sidney Franklin directed Smilin' Through (released in February, 1922). The story of a haunted impossible love in scenic Ireland was a gigantic hit — so big that it has been remade twice. After this, Schenck had the whole operation moved to Hollywood, where Norma's films got bigger, glossier, and even more popular—for a time. Her film Secrets (released in March, 1924) was a success with critics and the public alike. Even though husband Joseph had gone over to run United Artists, Norma had a contract to continue making films for First-National, for whom she made The Lady (released in February, 1925), and Kiki (released in April, 1926). Her last film for First-National was another version of Camille (released in September, 1927), where she fell in love with her co-star, Gilbert Roland. Joseph Schenck was philosophical about this; he began to release Norma's films through United Artists, and he continued to pair Norma and Roland in films together. But United Artists had distribution problems, so these later Talmadge films did poorly. The introduction of sound was a worry; Norma trained extensively, but the films she performed in were of dreadful quality. Her career nosedived. Constance advised Norma to hang it up, and she did. Marriage to George Jessel, divorce in 1939, then marriage to Dr. Carvel James, led to an active retirement of travel and entertaining; arthritis caused her to move to the warm climate of Las Vegas, where she was felled by strokes in 1957. She was only 63. Grauman's Chinese Theatre, Hollywood, California. 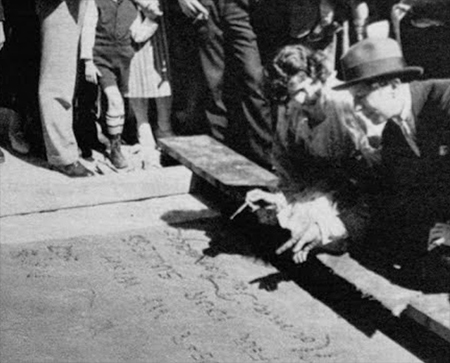 Norma Talmadge Forecourt ceremony, Wednesday, May 18, 1927. Sid Grauman observes with Ms. Talmadge in this publicity photo.